about a multitude of mapmaking topics for easy reference. If you think you have a good idea to submit to this thread, PM an UMS Assistance mod or GM. If you believe any of the information in this reference material is false, PM UMS Mapping Assistance moderation. Start Locations do not count towards the unit max. Maximum Number of Sprites on a Map: 500. Yes, a null(empty) string takes up 3 bytes, any additional characters add a byte, so the string "Fat chicks" would take up 2(offset) 10(characters 1(null terminator), 13 bytes out of your maximum of 65535. Max Amount of Triggers: Unknown. In the most recent version of SCMDraft, somewhere between 90 and 120k triggers are supported. There is no known limit for Starcraft itself however, except perhaps physical memory restrictions. 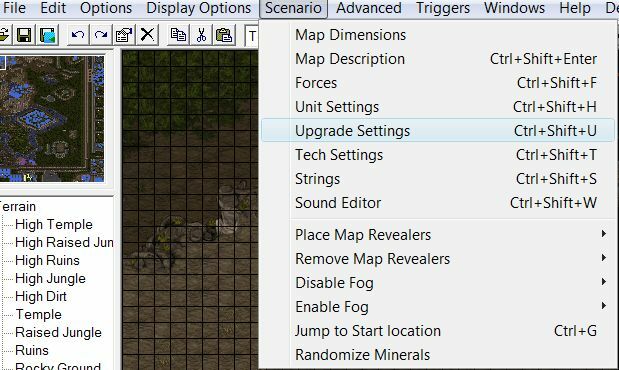 In the Jungle tileset, with the "low ground" box checked, units on jungle, ruins, and raised jungle will be detected. "low air" corresponds to an air unit above "low ground"
"Medium ground" is high dirt, high jungle, high ruins, and high raised jungle, or regular temple. "Medium air" corresponds to air units above "medium ground"
"High ground" is high temple, or temple on high dirt, and nothing else. "High air" corresponds to air units above "high ground." A unit is registered as inside a location if any part of the unit is right of the location's left border, left of the right border, below the top border and above the bottom border. Under normal circumstances, of course, this creates a rectangular area that units can enter. Inverted locations are locations that have any borders that have been flipped (you can do this in Scmdraft by manually setting the location parameters in the location's properties window) . The same principle given before applies in this situation- if the left and right borders are inverted (the right border is left of the left border) a unit still needs to be right of the location's left border and left of the right border- in other words, the unit's 'area' must be outside both the left and the right borders and within the top and bottom. For a location with both the top and bottom and left and right borders inverted a unit must be outside all four sides of the rectangle to be 'inside' it. The advantage of using inverted locations is that they can be used to detect if a unit is in an exact position (if fitted to that specific unit) and thus can be deployed for near instant unit movement detection. Other uses include varying degrees of unit movement. the location because it is outside both the left and right borders. The blue Ultralisk is not inside. This action will prevent the rest of the trigger (the actions below it in the list) from running until 1000 milliseconds have elapsed. Only 1 Wait( ); action may occur at any time per player. This is where Wait Blocks occur. Wait(1000); occurs, the second Wait cannot execute until the first finishes. Wait(0);<-----62 or 63 times, depending on if you want a comment or not. I personally find it easiest to have Player 8 (a computer player) have the Hyper Triggers at the bottom of his trigger list, just for good measure. the minimum time between checking triggers, which is 84 milliseconds, or 2 frames. A Death Counter is a integer variable used in many maps to store numerical information. Each unit type has its own death counter, and each player has his own deathcounters for each unit type, so a Player 1 Terran Marine death counter is not necessairly the same as Player 2 Terran Marine death counter. A death counter stores the number of deaths of a certain unit type each player has suffered (kills via triggers do not count). So each time a Player 1 Terran Marine dies, the corresponding deathcounter is increased by 1. Death counters can act as conditions for triggers. One can make a condition such as "Player 2 has suffered at least 5 deaths of Terran Marine", which will be true every trigger loop when the death counter of Player 2 Terran Marine is greater than or equal to 5. As well as being used in conditions, death counters can be modified by trigger actions, like so: "Modify death counts for Player 1: set to 5 deaths of Terran Marine". This will make the Player 1 Terran Marine deathcounter equal to 5, disregarding the amount of deaths of Player 1 Terran Marines. As well as setting death counters to a specific value, one can add or subtract from the values by using "add" or "subtract" instead of "set" in the given trigger action. This crucial aspect allows death counters to be used as variables. It is important that if you decide to use some death counter as a variable, you must make sure that the corresponding unit does not die anywhere on the map, because that will add 1 to the deathcounter and edit the information it holds. In this case, "Player 1 has suffered exactly 12 deaths of Marine" will be a true condition, and so will "Player 3 has suffered at least 2 deaths of Ghost"
In the given case, gas represents the amount of revives the player has. Every time the player's Terran Marine (hero) dies, the corresponding death counter is set to 1. Hence, if the player has atleast one revive, a new marine is created at the "hero_revive" location, one gas is subtracted, the Terran Marine death counter is subtracted, the player's screen is centered on the hero and a "You have been revived!" messge is displayed. Using Forces in death counts takes the sum of all players deaths in that force. Say we want to do something like "Force 1 has suffered at least 5 deaths of Unit Y", and Players 1,2,3, 4 and 5 are in force 1. There are multiple ways to fulfill this condition, Player 1 could have 5 or more deaths of Unit Y, Player 2 could have 2 deaths and player 3 could have 3 deaths, or each player (1,2,3,4,5) could each have 1 death, or any other assortment of ways so that the sum of deaths for all players in the force for Unit Y is at least 5. Since not every unit is used in every game, death counters can also make very good timers, which is critical to avoiding wait blocks. "Set" or "Cleared". These don't actually affect anything in the game, but are useful because they are global, and can save you some death counts. an action like "Set deaths for Current Player to 1 for Unit Z" in Player 2's triggers, it won't add a death count for Player 3. For a player to be able to burrow, he must have the ability researched or enabled. If it is disabled, a player can still control a burrowed unit but will be unable to unburrow it, even if it's a lurker, by first creating it burrowed for a player with burrow enabled, then giving the unit to the player who has it disabled. a computer will always be able to unburrow even if he doesn't have the burrow ability researched. Spamming AI scripts has also been known to cause lag, and large numbers of units moving will contribute to lag, due to the necessary memory and processing requirements for pathfinding. When checking the conditions of triggers Starcraft reads from top to bottom. When one of these returns false, it discontinues. Lag created by excessive condition scanning can be partially diverted by putting the conditions most likely to return false at the top of the condition list, limiting the number of conditions that need to be checked. to affect, for example: If you want Player 2's men to enter a dropship, Player 2's trigger must run the AI Script. --Nuking Link: We don't have an article to link yet!!! whose units you wish to affect, for example: Player 1's trigger could order Player 2's Marine to walk across the map. Players 9, 10, 11, and 12 are extraneous neutral players that can be used for many capacities but have many limiting attributes (Player 12 is listed as 'Neutral' in Scmdraft). Players 9 though 12 cannot own triggers, and hence cannot run AI scripts, disabling the ability to set alliance or vision statuses. If provoked player 9-11 units will follow the assailant but not attack it- this is because they do not have vision (and cannot be given it by any means), not even for their own units which makes them unable to attack. You can read Player 9-12 death counters but you cannot set them by actions (adding to their death counters must be done manually by killing their units) effectively eliminating use of their deaths as a dynamic variable. While players 9-11 act as hostile computers without vision, player 12 is neutral. When any player leaves the game their units are automatically given to player 12. Similarly, all dark swarms and disruption webs are cast automatically owned by Player 12, no matter the player that cast it; this is why it is impossible to know which player cast them unless only one player could have (IE only one player has the ability to cast it, or only one player has a defiler/corsair within range to cast it). 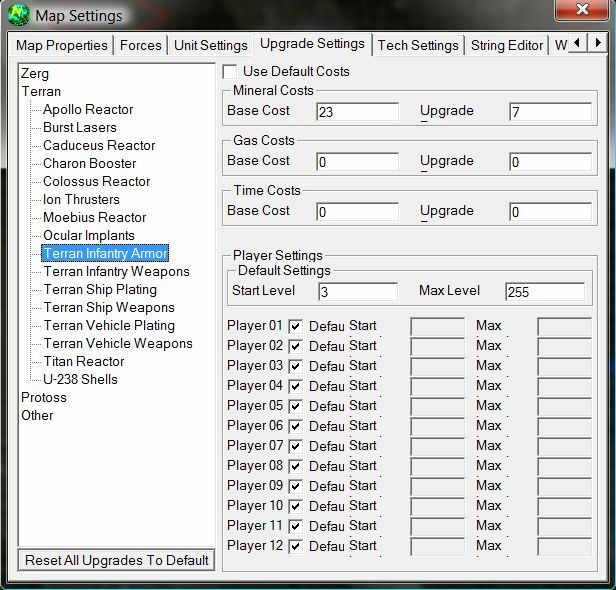 Abandoned addons are automatically given to player 12 and resources are owned by player 12. Perhaps the most intriguing aspect of player 12 is that players retain alliance statuses with units given to player 12. If player 1 is unallied with player 2 and a player 2 unit is given to player 12 unit, player 1 will still be unallied with that unit, despite his alliance status with player 12. If player 1 then allies player 2, player 1 will then be allied with all player 12 units that were given from player 2. Setting alliance status with player 12 only effects the player's alliance status with preplaced player 12 units and the color of the selection ring (yellow vs red) around player 12 units. Players 9-12 can not have units created owned by them, but can be given units (even immediately after creation by different player) and can have preplaced units. Units given to player 12 also retain their colors (however, this is not reflected on the minimap). Players 9-12 do not need start locations, cannot be set to human open slots, cannot have player color set and cannot be seen in the game lobby. To alter a player's vision statuses, we can use "Run AI Script" action "Turn ON/OFF Shared Vision for Player X". The action may operate opposite of how you might imagine, however- turning ON/OFF vision with a player does not change the trigger owner's status with that player, but rather turns on or off that player's shared vision with you, the trigger owner. For instance, if one wanted to give Player 2's vision to Player 1, we would Run the Ai Script "Turn ON Shared Vision for Player 2" in a trigger owned by player 1. After this trigger owned by P1 runs, he will be able to see all of Player 2's units, and cloaked units owned by Player 2. One should note, however, that it takes a moment for this change to be taken into effect. Another application and possibility of changing vision statuses is to turn OFF shared vision with the player that owns the trigger. 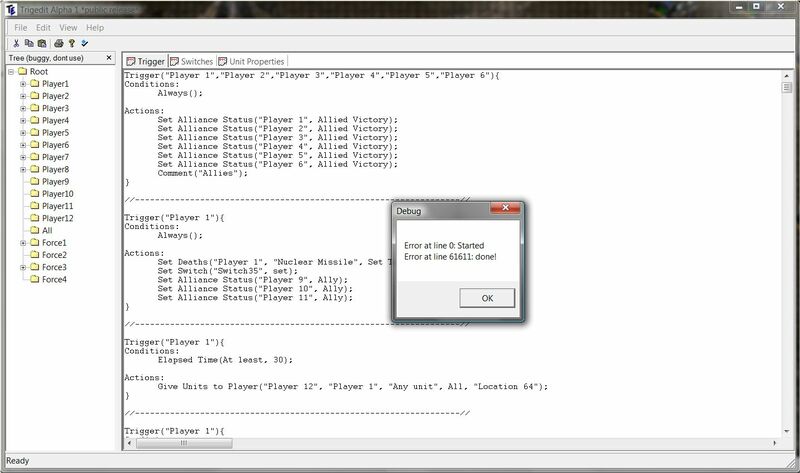 IE Player 1 would run the action 'Execute AI Script 'Turn OFF Shared Vision for Player 1'. This would remove Player 1's ability to receive vision from his own units. If, however, his units are visible to him (by being within vision of a player he receives vision from) the units will always be detected for him. For example, Player 1 could not own a Dark Templar and see the area its in but have it be cloaked. Either P1 can not see the whole area, or he can see the area AND his own cloaked units. and "Make these Units Patrol" at the location where the scarab is. the player you are trying to attack, then run the AI Script "Junkyard Dog" at the scarab. The location you run JunkYard Dog at must be as small as possible, because the scarabs tend to attack targets that are outside the location. unwalkable location, like a location over water, or a location on a cliff face (anywhere a marine cant walk to), and it will detonate, dealing damage. If you get any other error message, your text triggers are not formatted correctly and they didn't save correctly. To cloak a beacon, two things are required. Use the action "Disable Doodad State" on the beacon. either give vision to the player owning the beacon for a short time, or cloak it near a detector. it will center their view on the start location. Players without start locations will not be present in your game, even if you placed 100 other units for them. 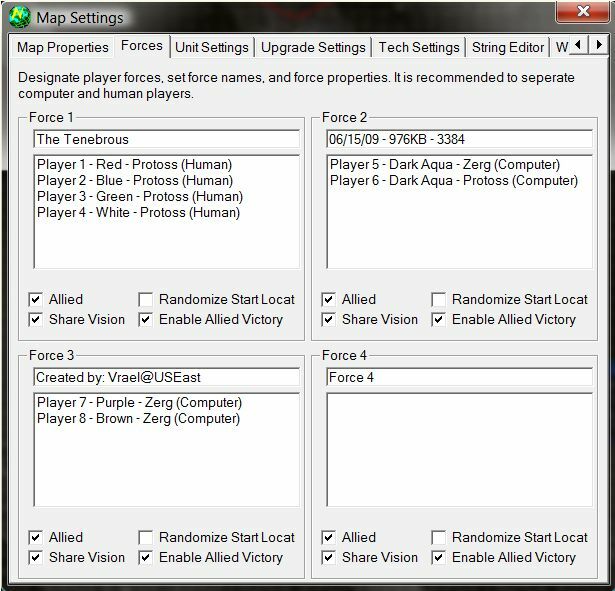 In the Forces menu, if you have "randomized start location" checked, a player might not always be the color you want. Each unique set of unit properties in the "Create units with properties" trigger action takes up one CUWP slot. There are 64 CUWP slots in total. This means that one can have an unlimited amount of identical CUWPs in the triggers' actions, but only 64 unique ones. Map revealers can be pre-placed or created. The strange thing about them however, is that they do not exist in any location. its hard to figure out why your location isn't going on the map revealer for apparently no reason. "Remove Unit" or "Kill Unit" action, since they are not location-dependant. 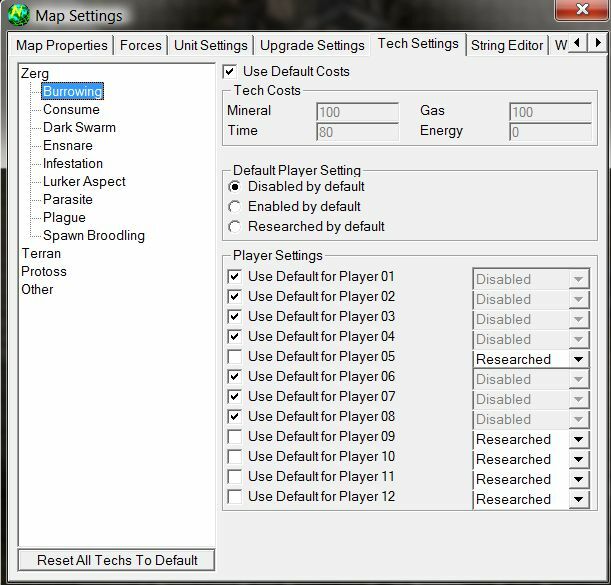 This will remove all map revealers for a player. Map revealers also cannot be given to another player once created. Just a quick personal note: COMPRESS YOUR MUSIC BEFORE PUTTING IT IN A MAP! NO ONE LIKES 12 HOUR DOWNLOADS! Once a you play a sound, it can not be stopped. More than one sound may be played at any given time. is just a matter of trial-and-error. and make it a Mono track right off the bat, cutting down a lot of filesize, and you can also reduce the bitrate to make the file smaller. Audacity can also do some cool things like making your music louder or quieter, faster, ect. Post has been edited 6 time(s), last time on Apr 9 2017, 9:17 am by NudeRaider.